Hello everyone! I apologize for the lapse in blog posts, it has been a wee bit crazy busy lately. I wanted to share photos of the bead soup I sent my partner Grace in the 7th annual bead soup party (challenge). I haven't heard from my partner, but the delivery confirmation on the package I sent was February 13th, so hopefully she has looked at her package by now. I hope she likes it!!! 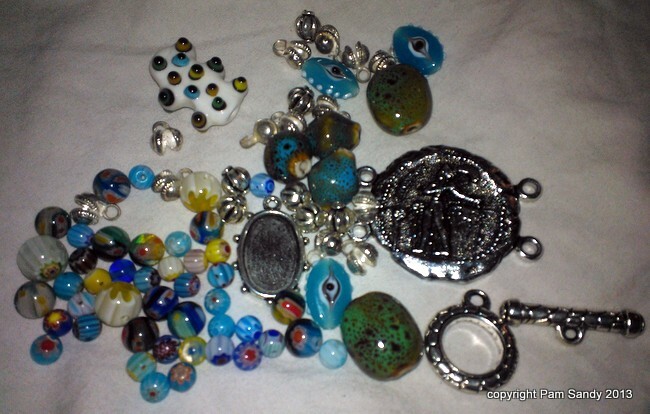 First photo is of the bead soup (left) and the extra vintage earrings (right). 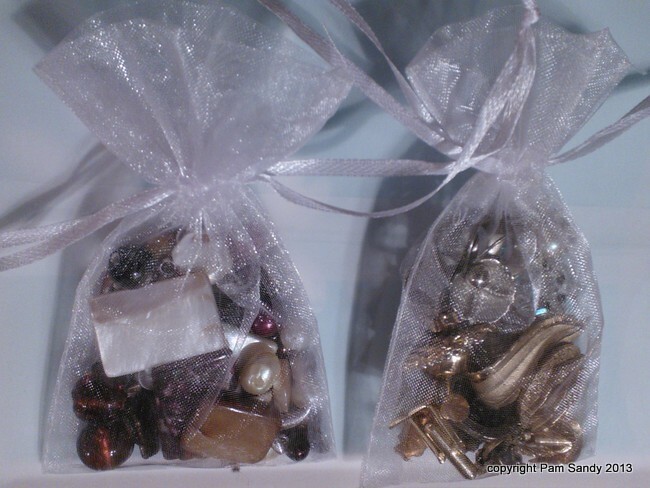 I packaged both in organza bags. Here is a photo of some of the vintage earrings I sent, except the bottom right earring. I sent a variety or vintage earrings (only one of each style, gotta mix things up), but I do not have photos of some of the styles (at least not out of the organza bag, yikes) since I have used the partner earring or piece of several items in my mixed media projects or for pendants. This pic is reflective of the style of the pieces, or the partner of several of the pieces I sent. I love vintage jewelry that I can cut up or use in other pieces. It is really fun to upcycle or recreate items. I wanted to send these as a bonus, since Grace does steampunk jewelry, and I think she could do something amazing with the vintage items. Hope she likes these too! I have to say, the beads are not my usual style, which is OK since that is part of the fun of the challenge. Truthfully though, I had a moment of panic when I opened the package, especially with the eyeball beads and the lumpy bumpy glass bead that looked like it had lots of fish eyeballs on it. They kind of scared me. :) The milifloral beads are colorful and interesting, but not my normal style either. The funny thing too is I have beads like the ceramic beads but mine are heart shaped. 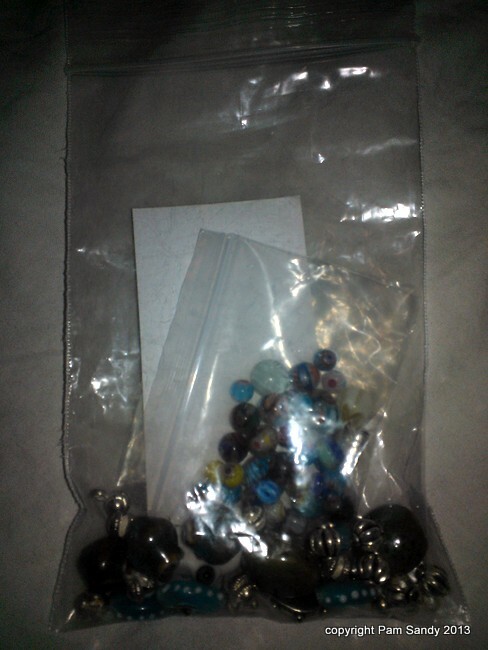 I have never used them because they are a bit bigger (like almost two inches) than those in the bead soup, and I wasn't sure what to do with them once I received them. Do you ever do that? Order something and when you get it think, Why did I order this??? What was I thinking of making? Anyway, after thinking about the variety of beads in the bead soup and what I could create with them, I got busy. First, I grabbed my trusty wire and instantly felt calmer and more grounded. After cutting and twisting my way through things I had a bracelet, necklace, and a pair of earrings! How cool is that??? I blended some items in my jewelry making stash to create a gift set for a friend, and I am pretty sure she will love it. Her eclectic and international style is in line with the bead soup I received, and with the use of wire it fits my style of jewelry making too, perfect match. So happy I was able to create something with this colorful variety of beads! I am thrilled that something that kind of had me panicked ended up turning out well. It is good to try something outside our comfort zone every now and them. I can't wait to see what other participants do with the huge variety of bead soups that went out. Once reveal day arrives I will share photos of all the items I created. Great soups! I’m part of the bead soup party. Looking forward to the reveals. I'm now following you. I have a new blog. 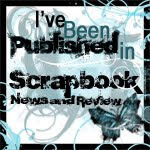 Please consider following my jewelry blog. Thanks.